It’s been a couple years, but we thought we’d re-launch our ever-so-popular Super Bowl Commercial Bingo for the biggest football event of the year. As you may know, we’re big sports fans, and even if you’re not a Broncos or Panthers aficionado (we’re not), you can always enjoy the moments between the plays… THE COMMERCIALS! Below is our official Bingo card for Super Bowl 50, and here’s a link to 10 unique Cards for your very own party or get-together. Don’t worry… we already checked and every single square has been validated ahead of time, so there’s no way someone WON’T win. Cheers to this Sunday and enjoy all the nachos and beer your heart desires… we certainly will. The real question is… what’s the prize? 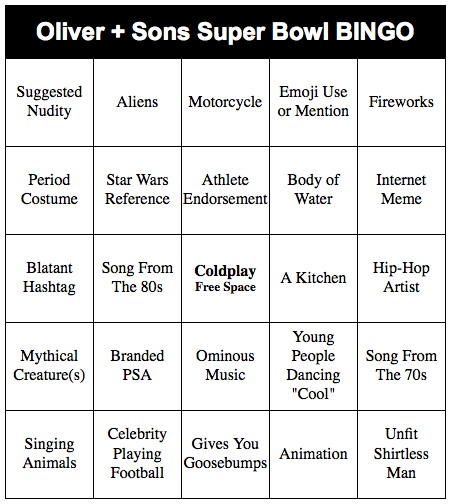 Tweet us your thoughts on the commercials and how your Bingo game is going @Oliver_And_Sons!